Home » Seam or Seem – What’s the Difference? Homophones are words that sound alike but have different spellings and meanings. Such words can be a source fun, but they can also be a source of confusion. Seam and seem are two homophones that can confuse writers. If you are referring to a joint between two pieces of fabric, would you spell the word seam or seem? What about if you are relating a way in which something gives an impression? If you don’t know the answers to these questions, you aren’t alone. Continue reading to learn more about these two confusing words. What is the Difference Between Seam and Seem? This article is a comparison of seam vs. seem. I will use both words in several example sentences, so you can see each word in appropriate contexts. I also show you a mnemonic device that makes choosing one or the other of these words a bit easier. What does seam mean? Seam is a noun. A seam is the place where two pieces of fabric or other material are joined. Articles of clothing have seams, as do other textiles like blankets, rugs, the seats of cars, and leather goods. Mary took her new dress to a seamstress to have a seam adjusted. The couch cushions are so full of stuffing that they are literally bursting at the seams. Seam can also be used more broadly to describe a line where two things meet. Seam itself comes from an Old English word that was related to the word we now use as the modern-day sew, which explains why it is so tied to the world of textiles and clothing. Seam does have limited uses as a verb, as well, but it’s much more commonly used as a noun. In its verb sense, to seam something is to join it with a seam. This sewing machine can be used to seam garments. What does seem mean? Seem is a verb that means to appear or to give an impression. In practice, seem is usually used with an infinitive or another word. “Kendra doesn’t seem to enjoy her dates with Jori lately,” said Elyssa over brunch. “I’ll enjoy dating him if Kendra doesn’t want to do it anymore,” said Marie, who seemed to be joking. This verb is a relic of Middle English. Even in Middle English, it was a version of Old Norse words for same and to fit. Seem has been in use in English since sometime in the 13th century. These two words are homophones, but they are never interchangeable. A seam is a joint between two pieces of fabric or other material. Seem is a verb that means to give an appearance. 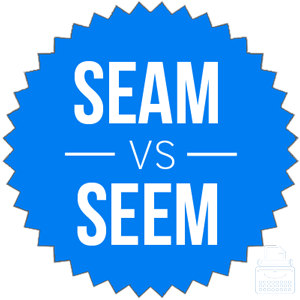 Seem vs. Seam Check: Since seam contains an A, and an apron is a garment that has seams, simply remember the shared letters between apron and seam to establish the proper context for this word. Is it seem or seam? While seam and seem are homophones, they are never interchangeable. Seem is a verb that means to appear or give an impression. Seam is a line where two things are joined, especially two pieces of fabric. These words can be confusing, but their meanings are clear and distinct from each other. 1 What is the Difference Between Seam and Seem?